Throughout the school year, I will be reviewing products as a member of the Old Schoolhouse Review crew. I received these items free of charge in exchange for my honest opinion. I am thankful for the chance to try new things and I hope you enjoy hearing about our experiences. My latest review is a Bible study curriculum created by Positive Action for Christ that I am using with my son Random. Now before you think I am a strange or a movie star like person who has bestowed the name Random upon a child, don't. Random is my third born son who is 13. He used to be Benny G. Bloggers often think they can remain anonymous so they don't want to embarrass their little darlings and their husbands. They give them cute names that reflect their personalities. Random always blurts out random funny sayings and changes the subject frequently. It never ceases to amaze me how in just three sentences we can go from the deity of Christ to the latest Ipod app, seamlessly. I chose Random as my guinea pig test subject or student because he loves to discuss the Bible and analyze things. I decided a little one-on-one Bible with my son could be something 'positive'. I have never been one to make our Bible lessons too school-like. I want to save workbooks for grammar and math. Below is my vision for my children and their Bible studies. Sitting by the fire finding comfort in studying the Word of God. For Random here, sitting by the fire doing any schoolwork is perfect for him. You may remember my short post a few weeks ago when I posted a blog cruise post? As a matter of fact, it was my only blog cruise post. When the kids were asked their favorite part of homeschooling, Random picked Bible time. I was shocked. I was convinced he would say gym. 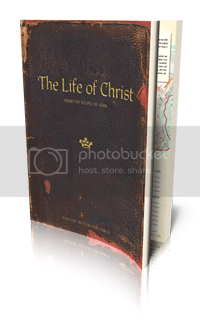 At that time, we were into our first weeks of the Life of Christ Bible study written by Frank Hamrick. To many people Christ is merely a historical fact, rather than a living, personal reality. We know that Christ lived, and we know much about what He did; however, even we as Christians seldom experience His presence as we should. The purpose of The Life of Christ from the Gospel of John is to make Jesus Christ real to your students. Our hope as you journey through this material is that your students will not only know Jesus more, but also love Him more. This is a bible study that can be used in a classroom or homeschool setting, it would be best used in late middle school through high school years. There is a teacher guide with the answers, a disc to create transparencies, tests and a consumable student workbook. As you see in the photo, the books are beautifully made with color photos and illustrations. They cleverly make the cover look like an old manuscript. The lessons can be taught in 3 to 5 days. There are comprehension questions at the end of each lesson as well as extension activities to deepen the student's understanding. These assignments would be great projects to assign in a classroom setting. Last year was the first time I made the transition into assigning Bible as a subject. Paperboy has been doing Bible on his own since 8th grade. For years our Bible time consisted of reading our Bible along with a devotional book or topical study. Many of those books really touched our lives and encouraged us to apply the word of God in our lives. My first reaction to The Life of Christ was "It looks a little like schoolwork, Oh No!" Yes it did and yes it is. The history and geography studies before we even got into the actual lesson were very in depth. I thought for sure I had lost Random. We took turns reading it to eachother, reading the scriptures and being the scribe. It continued to keep our interest and attention. The one part he balked at was the unit tests. They were challenging even to myself. We only recently found, as I was reading the teacher notes to him, something that I personally did not agree with doctrinally. I was a little more forgiving than Random on this, but we continued our lessons. It was a launching point for why we believe what we do and I was surprised at his assurity in the Word. I had to encourage him not to "throw the baby out with the bathwater and carry on." It was a personal lesson to me to read over the notes before I read them aloud. I have enjoyed this study as I appreciate how it is organized, in depth and it can be applied to our current times. The political, social and physical backgrounds provided about the book of John has broadened my understanding of the Gospel. This could be easily adapted to more than one student, you would just need to purchase an additional student book for $17.95. The teacher's manual with all of the supplies needed costs $41.95. There are pricing options depending upon the desired format of the product. Wise Up is another study they offer, an in depth study of Proverbs that sounded very interesting to me. If you would like to see some of the other products offerred by Postive Action visit their web site or see what other crew members had to say about the products for older students or younger students. Once again, I received this product free of charge from the publisher in exchange for my honest review. I did not receive any payment nor was I required to post a positive review. I reviewed another product from this company, and I also felt like it was very "school-like." I would really like to know what you disagreed with doctrinally? I'm considering using this curriculum and I am really concerned that it be Biblically sound. Thank you.